If you look around at the landscapes of south Louisiana in mid-February, you may see leafless trees and shrubs, freeze-damaged tropicals and dormant lawns. But if you look closer, you will begin to see colors of hope inconspicuously placed among the winter drab of our landscapes. These pops of color in the gardens consists of camellia Japonica, Japanese magnolias and many cool-season annuals. One plant that tends to take a back seat to these all-stars is Carolina jessamine (Gelsemium sempervirens). This is a native vine that has a vast habitat. Carolina jessamine can be found as far north as Virginia; down to South Florida and as far west as Texas. The natural habitat of Carolina jessamine can be found on the woodland edges and also in semi-open fields. In the landscape, Carolina jessamine can be grown on trellises or along picket or chain-link fences to add a unique element to the garden. When choosing a location to plant Carolina jessamine, pick an area of the garden that receives full to partial sunlight and also has well-drained soil. Because Carolina jessamine is a semi-evergreen, late winter-blooming vine with fragrant yellow flowers, consider an area of the garden from which you can enjoy looking at it. Individual vines can reach up to 20 feet if the plant is left to grow naturally. 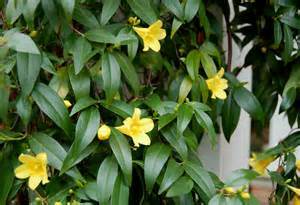 To control the growth of Carolina jessamine, prune in March or early spring. This will help maintain the shape and size of the plant to the desired dimensions. After pruning in early spring, be sure to fertilize with a general-purpose fertilizer. Aside from the many attractive qualities Carolina jessamine possesses, it is a beneficial plant to encourage wildlife to come into the garden. Its flowers attract our native bees, hummingbirds and the spicebush swallowtail butterflies. This plant typically has very little disease and insect problems. It the vine is not pruned and becomes dense, wasps may become a problem. Neil Odenwald, a professor emeritus of landscape architecture at LSU, says, “All parts of the plants are poisonous if swallowed. Leaves, flowers and roots contain a poison that protects this native vine from forging animals.” He goes on to state that the plant is safe to touch; therefore, performing any maintenance on the plant will not be an issue.